BAC Credomatic is the number one bank in most countries of Central America. With a geographically prominent brand – it might seem challenging to connect every market while sustaining brand consistency. Nevertheless, BAC Credomatic has successfully implemented a regional brand strategy, while ensuring local relevance. 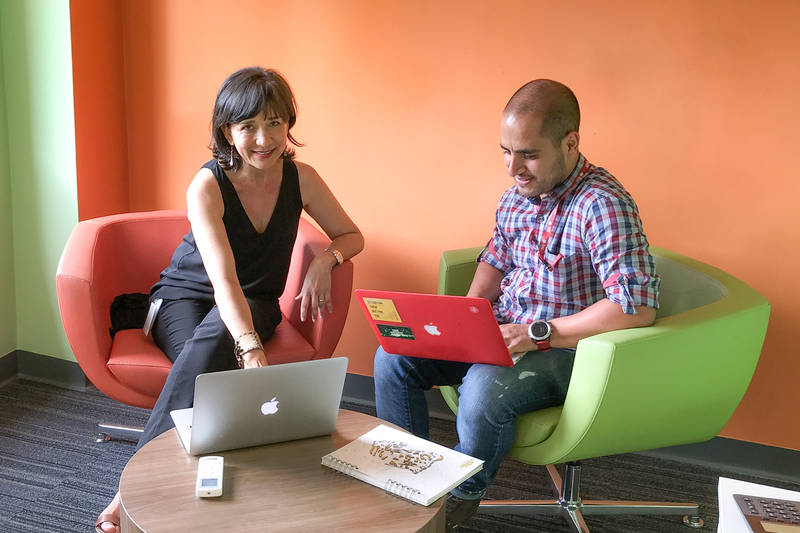 We had the pleasure to sit down with Irene (Regional Marketing Leader), Luis Morillo (Experience Designer), and Jose David (Regional UX Team Supervisor) at BAC Credomatic, to discuss their implementation of Frontify. Together with the NYC-based agency Lippincott, they had spent months shaping what has now become the new face of their organization. 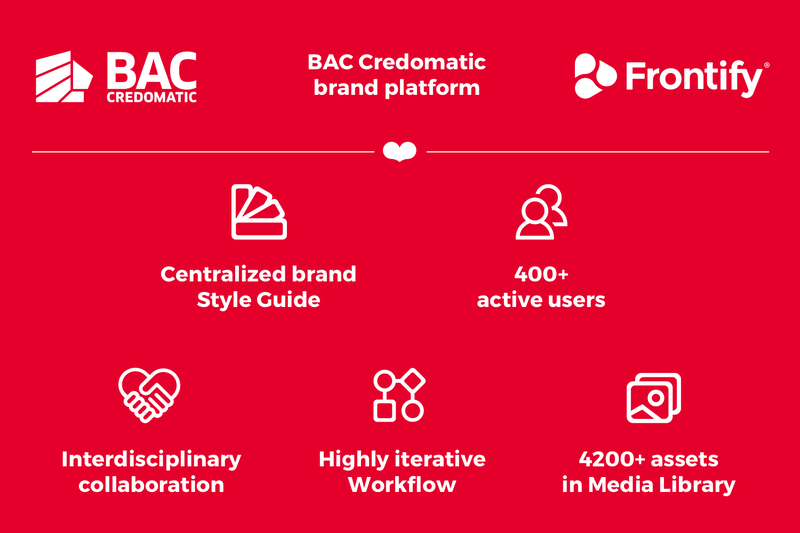 Before the implementation of Frontify, BAC Credomatic did not have a regional brand strategy, and no global brand standards. This meant that the numerous amount of local design-teams came with as many different logos, colors, and voices. Coordination was required. "We wanted the new face of our brand to convey accessibility, digitalization, and proximity to our clients. In earlier years, we grew by acquisition, and with every new investment came additional visuals." As BAC Credomatic's design team grew, collaboration on design assets had become increasingly complicated. Finding a way to maintain a strong collaboration between the three parts of their magic triad (design, development, and business) became priority. By investing in brand management, BAC Credomatic had a chance to not only document their brand guidelines, but to develop a platform dedicated to streamlined asset creation, central brand governance, and maintenance of consistent brand expressions across all markets. A comparative software analysis was made, where Frontify came out as winners – thanks to the usability of the platform, and the very broad and scalable range of features it possessed. "We saw Frontify as something we could use every day. Every new asset can go through the previously set Workspace approval process before it conclusively is uploaded to our Media Library, and finally put into practice. Amazing." Starting off, they assigned one brand leader per country market, that person first had to upload and approve their local assets in accordance with the new brand guidelines, while making sure that future asset creation undergoes the same procedure as well. Daily approval processes and continuous asset iterations quickly became the new standard. "With a new brand strategy living in our Frontify Style Guide, we could put every market in charge of keeping their own brand touchpoints consistent, and we’ve seen amazing results. We now have regionally streamlined creative processes, allowing not only smooth design iterations – but considerably stronger brand experiences overall." With their old assets filtered through their revamped brand guidelines, everything created locally started to go through the process. It worked. 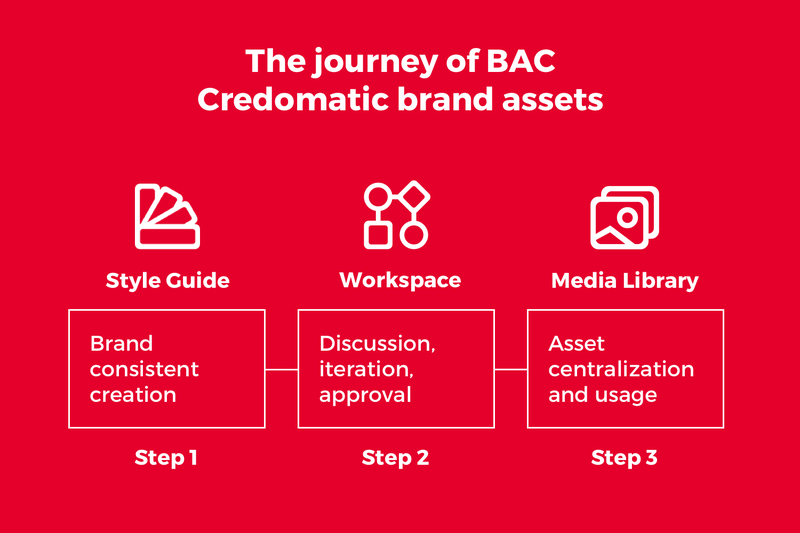 Now integrating interdisciplinary stakeholders both regionally and locally, allowing them to truly collaborate, BAC Credomatic had created a well-oiled machinery of brand production. With everyone kept in the loop, they could now abandon their old ways and focus on producing genuinely on-brand collaterals – resulting in much stronger brand expressions. "Today, everyone concerned with our brand is using Frontify – it's a part of our everyday life. 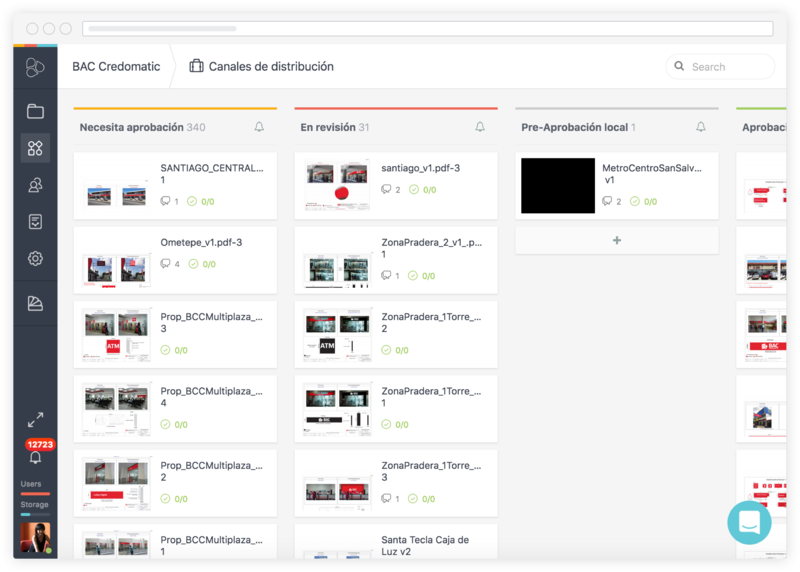 The main use of the tool is for sharing campaign-related assets in the region. The process of asset creation is still in use; preserving the consistent look that our organization has long sought." For the entire design team, Frontify had a huge impact when collaborating with external agencies. With Frontify, BAC Credomatic can simply grant agencies access to the brand guidelines, and approved assets. Previously, they would have a ton of meetings, followed by countless iterations. Frontify has reduced the number of meetings and made interactions much more effective, while also helping people to use the correct naming conventions of patterns. All teams and stakeholders now speak the same language.